Have you ever felt so cold you just can’t warm up no matter how hot the room gets? Just two weeks ago (my gosh, it feels like forever, though!) Mike and I were in Japan. Right before heading home we decided to do a little bit of train travel. First up on my list was Sapporo, on the northernmost island, Hokkaido. If you’re anything like me you’ve heard about the wonders of Hokkaido. All of Japan’s dairy comes from there – the cold temperatures make for some especially delicious butter, cheese, and ice cream. The cold waters around the island also mean that they have an abundance of super fresh seafood. And…Hokkaido is the land of potatoes. I love me some potatoes so of course I insisted we pay homage to the humble Hokkaido potato. 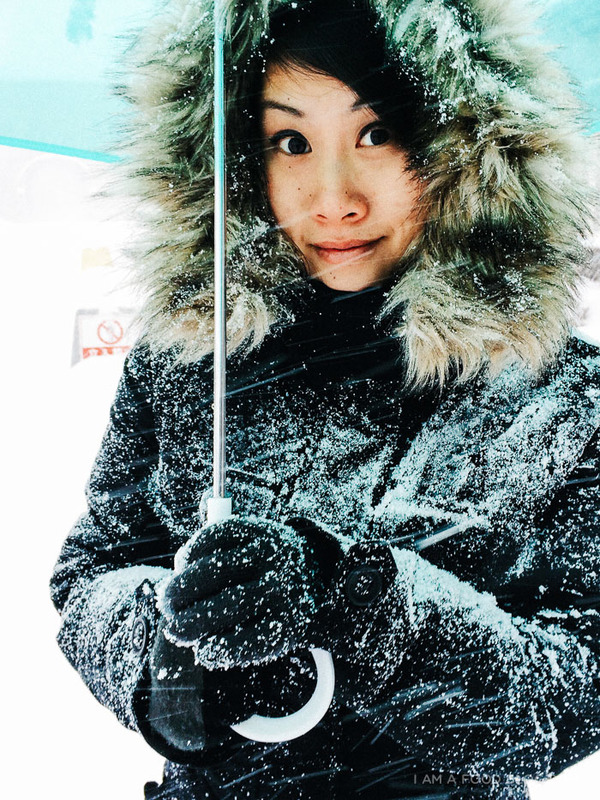 Well, as you might have guessed, Hokkaido was COLD. We were prepared for this. We stocked up on extra warm Heattech and toques. The first day was fine: it was cold and crisp but nothing we couldn’t handle. We laughed about how we thought it was going to be crazy and went off on a long walk in search of miso ramen. There was snow piled up around the sides of the streets but it was a novelty – a city that ran smoothly even while frozen. I guess we were a bit too lackadaisical about the cold and snow because when we woke up the next day Sapporo was covered in a thin blanket of the fluffy white stuff. It didn’t look so bad though so we stuck with our plans of visiting Otaru (a tiny port city with a canal running through) and the Nikka Yoichi Whisky Distillery. To be honest, Mike didn’t even want to go to the whisky distillery. Mike loves whisky and we both love factory tours, but he thought it was totally out of the way and not worth it. I, being the lovely wife I am, insisted that we go. After all, it was only a twenty minute train ride. I figured we were in Hokkaido, why not check out EVERYTHING?! Yeah, um, bad call. Do not check out everything in Hokkaido, especially if you go to Hokkaido in the dead of winter. 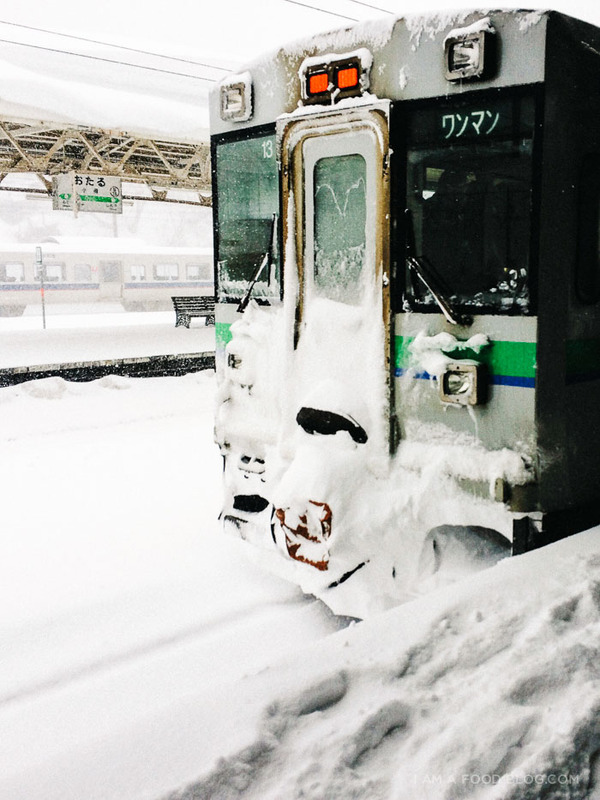 By the time we made to Yoichi, there was a major snow storm going on. Looking out the window was like looking a a pure white blank canvas with just the hint of texture from the condensation on the glass. It was bad, but at that point we thought we’d press on and at least take a peek at the distillery. A five minute walked turned into fifteen with all the wind and snow blowing in our faces. When we finally made it we decided to skip the outdoor tour and head straight to the free tasting room. It was at that moment that I realized why those old cartoons always had the cute St. Bernards delivering whisky to frostbitten wanderers. It warmed me straight up in the best way possible. It also made me never want to leave, but leave we did because that little place only had one train every TWO hours heading out of town. If we missed our train we would have been stuck. Otaru was out – the storm was getting really intense. Mike and I both feel asleep on the train ride home (a little too much whisky combined with warmth and the rocking of the train), which turned out to be a good thing because we ended up getting stuck on the tracks, in the middle of nowhere, for over three hours. It probably would’ve been less amusing if we weren’t slightly tipsy, but at that moment in time it seemed like a good time. It stayed a good time until the next day, when we almost didn’t get off the island! We were supposed to catch a train to Kyoto at 6 am and made made it to the station with half an hour to spare only to see a huge crowd hanging out in front of the gates. It looked like were were in some sort of post-apocalyptic snow world where there was only one train that people could live on and everyone was rushing to get on. Sound familiar? The Japanese train attendant who was in a cozy (and warm) glass-enclosed office told us, in Russian-accented Engrish no less, that our train was cancelled while seemingly laughing maniacally. Long story short, we made to Kyoto, and only 5 hours late! I really did have an awesome time though and would definitely go back. Next time I’m thinking summer – I hear the potatoes are fantastic in summer. 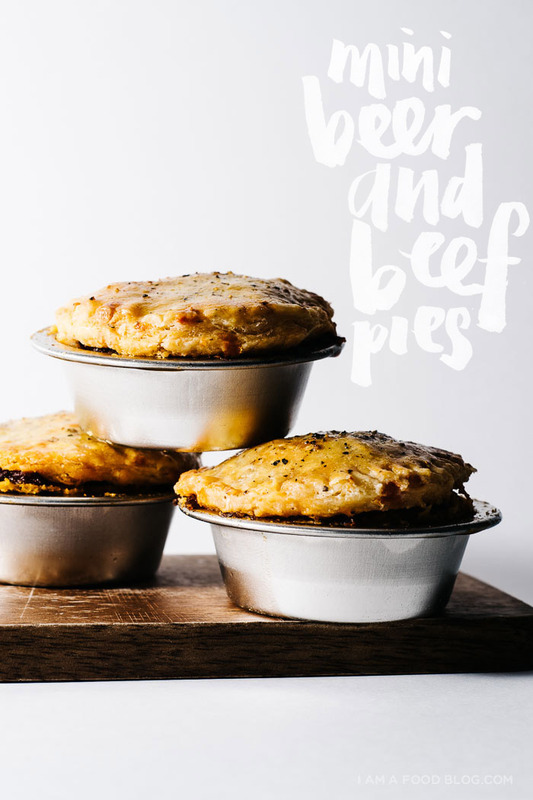 Whether or not you’re frozen, these little beef pies will definitely warm you up from the inside out. 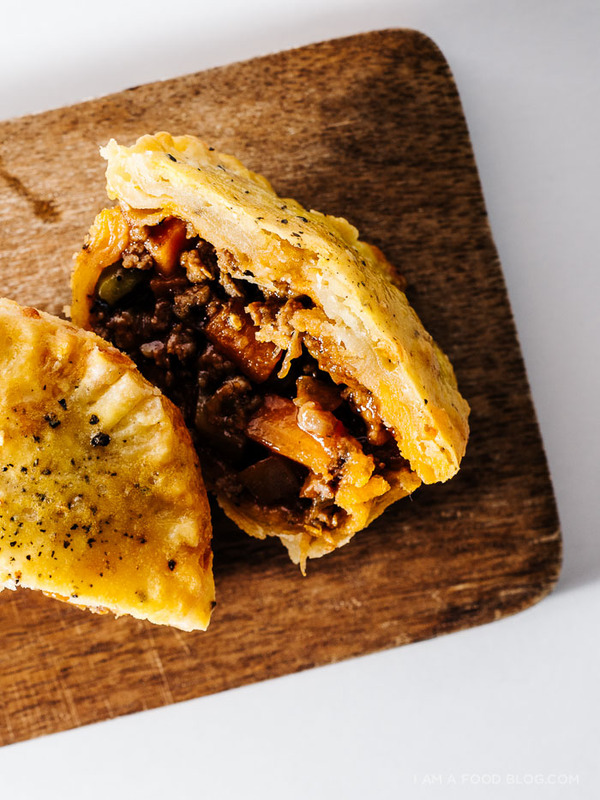 Savoury, saucy minced beef insides studded with carrots, potatoes and peas and flavoured with beer and tomato all wrapped up in a flaky cheddar crust. They’re good either at room temperature or hot, but I prefer hot just because it feels that much more cozy. 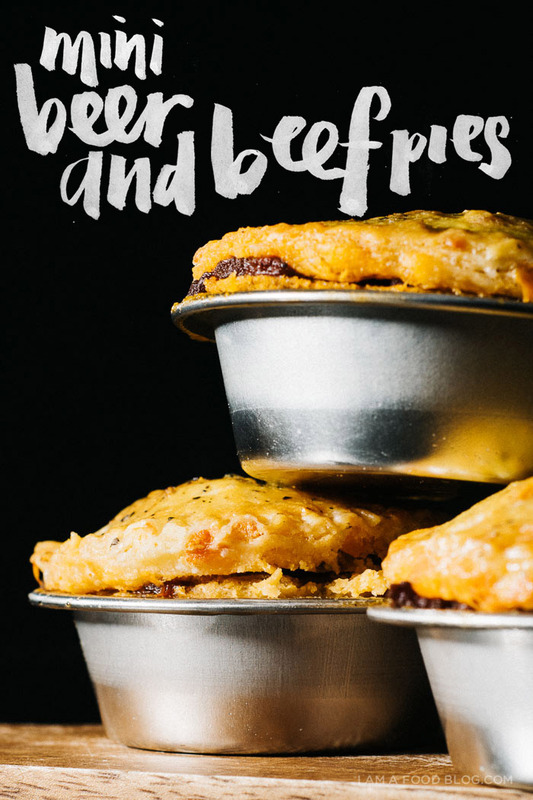 This recipe only makes 4 mini pies (they’re part of the savoury tier in my Valentine’s Day afternoon beer post), but if you’re looking to make a bunch the recipe scales up infinitely – you’re only limited by the number of pie tins you have. 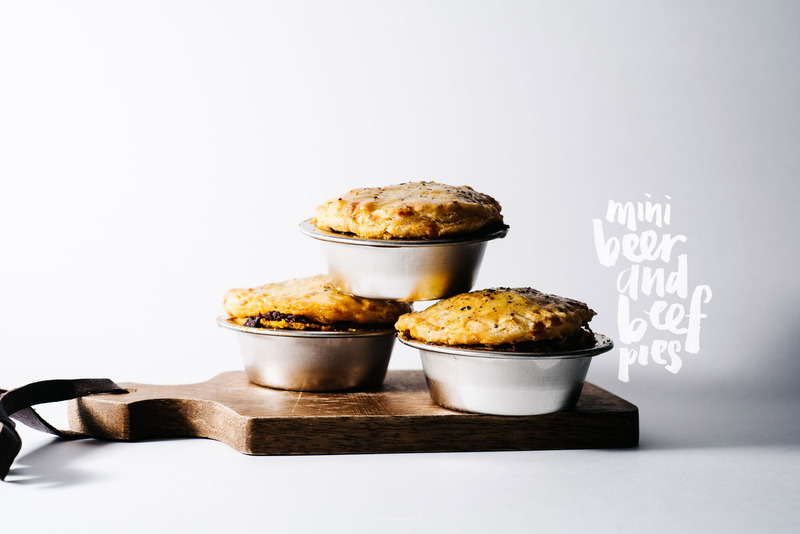 I recommend making them in regular size muffin tins or perhaps this cute mini pie cast iron pan. In a bowl, mix together the flour and salt. Using the coarse side of a box grater, grate the butter into the flour mixture. Stir in the shredded cheddar. Sprinkle with 2 tablespoons of cold water and stir until crumbly but holds together when squeezed. Add additional ice water, 1 tablespoon at a time, as needed. Bring the dough together, shape into a rough rectangle, wrap with plastic wrap and place in the fridge for 1 hour minimum. 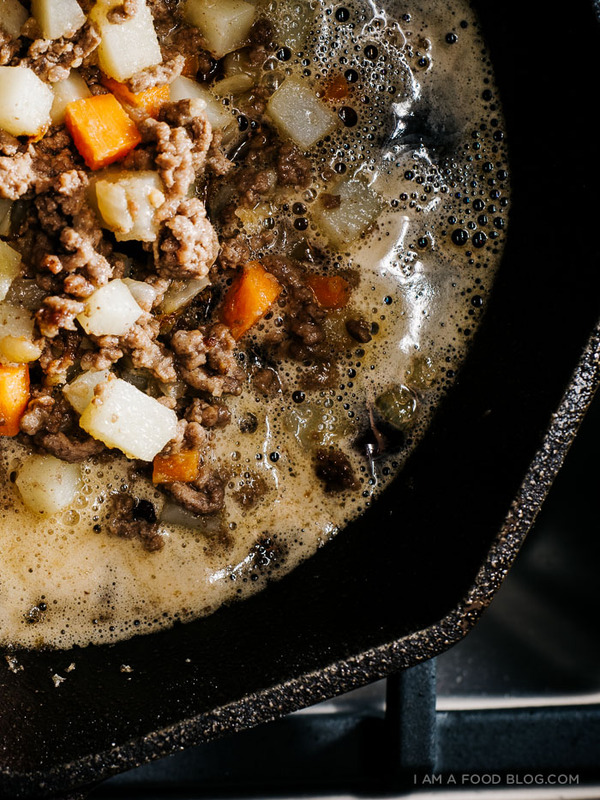 In a large skillet, heat the butter over medium high heat. Add the onion and cook until translucent and soft, 5-7 minutes. Add the garlic and cook until fragrant, 1-2 minutes. Add the beef, breaking up and and cooking until brown. Stir in the carrots and potatoes. Sprinkle the flour on the mixture and stir in. Add the beer and tomato paste, stirring often until the mixture thickens up slightly, 5-8 minutes. 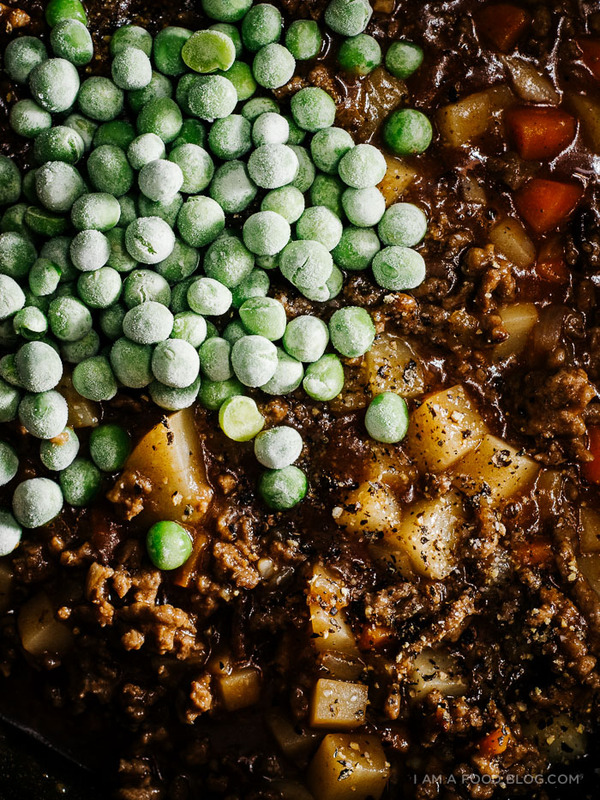 Stir in the peas, taste and season with salt, pepper, and a tiny bit of sugar. Let the mixture cool completely. 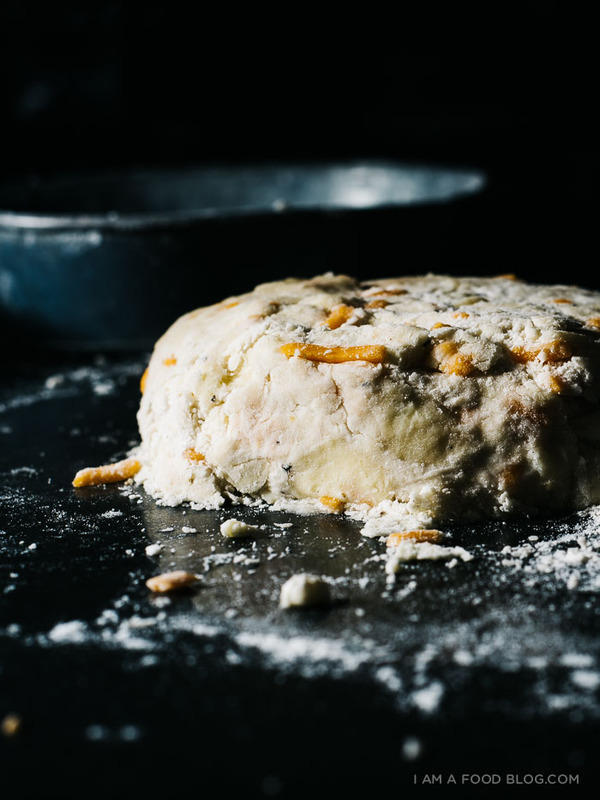 While the mix is cooling, roll out the dough to 1/8 inch thickness on a lightly floured surface. Cut out 4 circles that are slightly larger than the tins you are using. Re-roll if needed and cut out 4 more slightly smaller circles. Chill until ready to use. Lightly grease molds and line with the larger circle, pressing down slightly and making sure there is a bit of overhang on the edges. Spoon in a heaping 1/4 cup of the filling and place the smaller circle on top. Crimp the edges. Brush with egg wash and poke or slash a couple of vents to let out steam. Bake until lightly brown and crisp, about 30-40 minutes, rotating halfway through. Let cool slightly and enjoy warm or at room temperature. 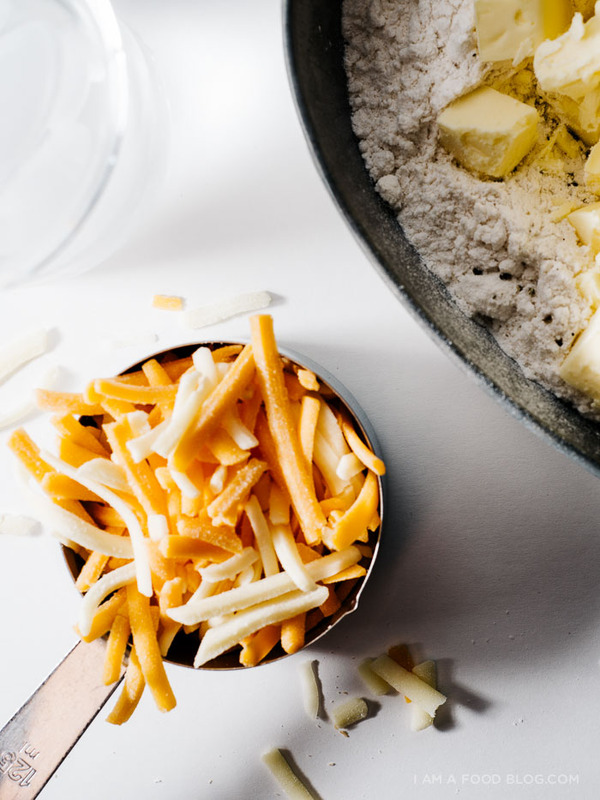 Note: Feel free to use store-bought pie crust – just stir a sprinkle of cheddar into the filling! AHHH PIE LOVE and that filling is mouthwatering! You look so cute in the snow. It is my dream to go to japan in snow one day! I can’t get over the photos in this post, Stephanie. They’re perfection! OMG, you look like you’re absolutely frozen solid in that last pic :) I LOVE this!! So much deliciousness surrounded by crust. Can’t go wrong. insane cold temperatures and snow?? all of the cheese?! sounds like where i live :) it really sounded like a fantasy land until you guys got stuck!! these pies look amazing!!! things like that always make being out in the cold worth it :) i can’t wait to have an afternoon beer party!! When I get that cold, it seems like a hot bath is the only way to feel normal again. Love that picture of you, really adorable. And these hand pies look delicious, of course. I might eat two. Oh good golly gee, these will knock some folks off the January diet train…They look scrumptious! I love that savory pies are so popular right now. I definitely didn’t grow up eating them but I’m really into the idea of them. I’m especially into cheddar crusts. YUM! Pie is a hug in food form! They look amazing. wow these look really yummy. i love savory pies!! omg such a crazy adventure!!!! but it warms my heart so much to read how you two made it fun instead of crazy stressful like it might have been for, say, me! xD you guys are too wonderful for words. my couple inspiration!!! <3 <3 <3 and OMG THESE PIES!! they sound like the coziest little comfort food ever. love this story and this post, lady! I’m fascinated by that skillet! Can you give us some info? 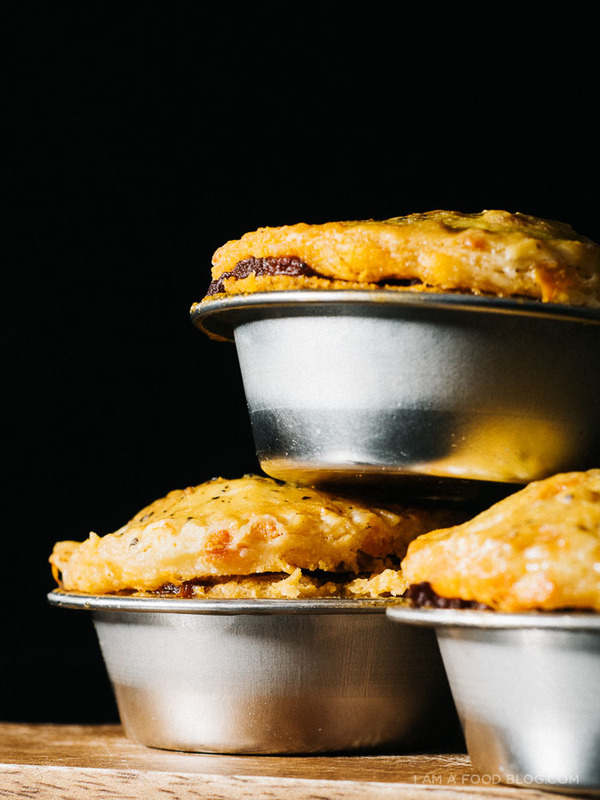 These little pies look like just the thing for another very cold place—North Dakota. While not as scenic and with far fewer whiskey distilleries we do get the cold and snow. Looks delicious! THIS LOOKS SO GOOD, Great Photography, thanks for posting! Glad you were able to make it through the snow! These pies look so delicious and perfect for a snowy day. I don’t have small molds but really want to try this. Can it work with just a regular-sized baking dish? you can definitely make it into a larger pie, but the recipe for both the crust and filling is pretty small – you’ll have to double or triple it as well as increasing the baking time to ensure that your pie crust cooks through. I’ve wanted to go to Japan . . but yeah, probably not in the winter time . . dude, I can’t seem to leave your blog right now. . too much deliciousness going on here! 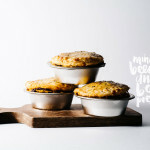 love these savory pies!!! oh my gawd! I Love your recipes! And the pictures of the steps. 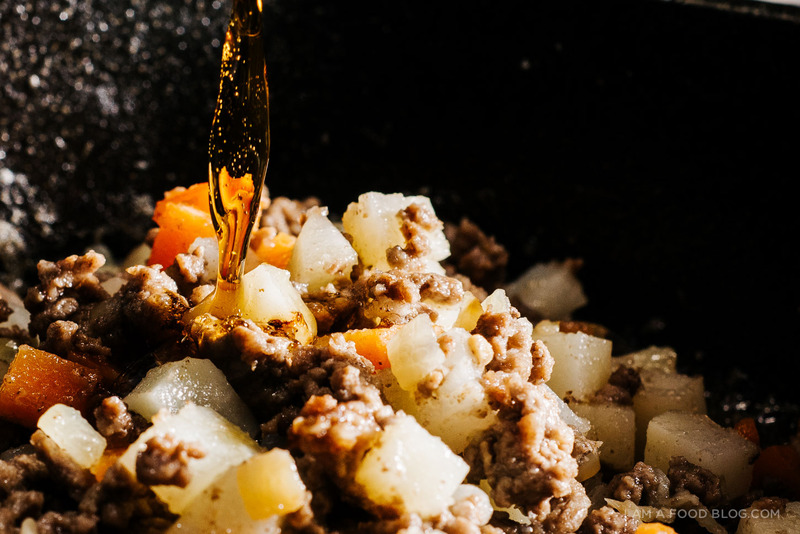 I always ask myself – How should the stuff Look like while Cooking? You often only geht to see the end result. I also like the start picture with the title in it. You immediatelly know what’s going on. I made these last week with a smoked porter from a local craft brewery. They were amazing. ooh i love a good pie, especially when it has two of my favourite food groups, beer and beef. Ill be sure to try these out. I’ve just spent about half an hour trying to google and search websites (william-sonoma, sur la table, etc) to find those molds you used/have pictured. Can you help a girl out?! These look right up my boy’s alley and I’d love to make them! Thanks! hey kate, they’re these ones here! Thanks for responding! I’m hooked on your blog. Hooooooly crap. These look phenomenal!